Ben Judd makes deceptively ‘gentle’ yet provocative work, often depicting highly stylised fractured communities, or representations of communities, disassembling and reassembling themselves through invisible or at least barely discernible forces and in seemingly ad-hoc arrangements – a choreography of artefact and performance. You can see one in particular I like here. Writing about a previous exhibition of his, Ben claimed that it engaged with “an historical overlapping in the development of the empirical and scientific with the irrational and mystical. It is this relationship between the distant and the near, between the unknown and the known,” an analysis equally applicable to The Part Versus the Whole his new exhibition in Liverpool that I have had some small involvement in. Last month Ben approached me, Maria Venegas Raba and Wanyi Zhang to make some work for a forthcoming exhibition. The exhibition, on from 9 June 2018-18 August 2018, is part of curator Rose Lejeune’s series of exhibitions called New Perspectives and takes place at Liverpool’s Victoria Gallery and Museum, a location which became crucial for the work Maria, Wanyi and I produced. Ben Judd, Victoria Gallery and Museum, Liverpool, 2018. Photo, Bethanie Brown. Combining an eclectic mix of materials from the existing Victoria Gallery and Museum’s collections and archives, including historic magic lantern slides and the archaeological photography of John Garstang, with new objects, performance and film, The Part Versus the Whole by Ben Judd is a commission for the VG&M as part of their New Perspectives 10th anniversary celebrations curated by Rose Lejeune. Through The Part Versus the Whole Judd invokes a lost community with its own internal systems, beliefs and taxonomies of knowledge. The installation weaves together threads of mythology with imagined and real histories of characters and architecture from the local environment to create an immersive installation. A performance on 9th June, and an accompanying film, imagine this community existing within the Victoria Building. The Part Versus the Whole is an invitation to viewers to experience a series of alternative readings of the Victoria Building’s, and Liverpool’s, history, to reimagine what might have been and to bring its possible futures to life. These are the drawings I made (though not all of them appeared in the exhibition). Alessandro Zambelli, in The Part Versus the Whole, Ben Judd, Victoria Gallery and Museum, Liverpool, 2018. Intended to suggest an undifferentiated primordial mass carved through by valley-like routes, this was made by overlaying every map I could find of the area. This notion of primordial urban genesis with blocks as ‘islands’ surrounded by receding waters connects nicely with the Ben’s installation narrative, but which for me also comes directly from John Outram’s London as Mythological Landscape lecture, a lecture I saw some time in the early 1990s. There’s a very poor recording of the same lecture delivered by Outram at the Architectural Association in 1991 here. Below is the key drawing from that lecture (though this instance of the image is actually taken from a lecture Outram gave at Sir John Soane’s Museum last month). John Outram ‘London as Mythological Landscape’ in John Outram reads from his 44 Lectures, Sir John Soane’s Museum, 2018. Photo of lecture slide, Emma Cheatle. Despite the density of mapping, certain features persist (roads and Lime Street Station for example) and some of them, like the exhibition venue itself, the building which is now called the Victoria Gallery and Museum, I manipulated in order to highlight. Faintly visible is the diagonal of the railway leaving Lime Street. Peeling away some of the maps reveals the Lime Street Station site with the railway leaving it as, perhaps, some kind of ceremonial precinct and route. This route seems to be called Liuerpul Great Way and it passes, eventually, under one corner of the Victoria Building. The site and route can be seen more clearly in the drawing above. Ben commissioned writer David Hering to flesh out the fictional origin story of Liverpool (here called, archaically, Liuerpul) and in his narrative David describes how original settlers were ship-wrecked on a series of islands which later became Liverpool. My drawing connects with this narrative and constructs a new one describing how the settlers journeyed, our fictional evidence suggests, a little way inland to what is now the Victoria Building, then a place they might have called the Metropolitan Salem. This term and others in the last drawing (Liuerpul Metropolitan Salem) are constructed only from words taken from the as-found overlaid maps. Zooming-in we see something more recognisably the Victoria Building, but overlaid with other maps of the site and the building interior. Fragments from different times co-exists as well as fictional elements: the Liuerpul Great Way is lined with tiles whose pattern echoes tiles found in the Victoria Building, alongside the ghost of the former ‘Lunatic Asylum,’ which, although long since demolished, hovers just to the north. In the meantime Wanyi and Maria designed and built this pleasingly threatening model of the site – partly a version of the overlaid maps and partly Joseph Gandy’s apocalyptic vision of Soane’s Bank of England. Maria Venegas Raba, and Wanyi Zhang, in The Part Versus the Whole, Ben Judd, Victoria Gallery and Museum, Liverpool, 2018. Photo, Bethanie Brown. 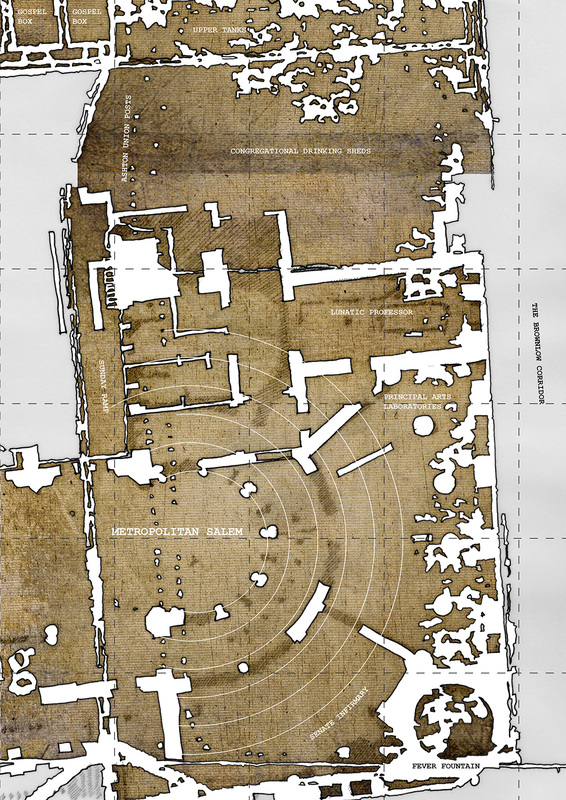 Stripping the overlaid maps of all of their text I then used that text to re-label a close-up of the plan, allowing overlaid features from plans of different times an equivalence of solidity and presence, blurring also the inside and outside of the Victoria Building. Emerging from archaeological layers is, perhaps, the amphitheatre-like form represented in the model. This, we believe, was what the early Liuerpulians called their Metropolitan Salem, fed by the waters of the Fever Fountain and all administered by that Spring’s Lunatic Professor. Later the people would feast in the Congregational Drinking Sheds, entertained by performances from the Gospel Boxes. But this is all, of course, pure speculation. Drawings by Alessandro Zambelli in The Part Versus the Whole, Ben Judd, Victoria Gallery and Museum, Liverpool, 2018. Photo, Bethanie Brown. Judd, Ben. “Stories in the Dark – Contemporary Responses to the Magic Lantern.” Whitstable Biennale [online] (2016). Lejeune, Rose. “New Perspectives: The Part Versus the Whole.” Victoria Gallery and Museum [online] (2018). Ben Judd, “Stories in the Dark – Contemporary Responses to the Magic Lantern,” Whitstable Biennale [online] (2016). Rose Lejeune, “New Perspectives: The Part Versus the Whole,” Victoria Gallery and Museum [online] (2018).